The slim-line monochrome LCD display and lightweight radome antenna make it ideal for power or sail boats as small as 17 feet. This 2.2kW radar has a 16 nautical mile range, yet will zoom down to 1/8 nautical mile for tight navigation in harbors and inlets. 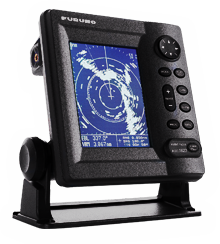 The 1623 radar lets you readily identify objects, thanks to a high definition 6" Silver Bright LCD screen that clearly separates targets. Plus, the four-tone target display lets you easily differentiate between stronger and weaker echoes, helping to alert you of any danger. The 1623 features many user-friendly operating modes, including normal, Off-center, Zoom, and Watchman mode. In Watchman, mode, the antenna is stopped and transmission is off, while the screen displays useful navi data only. The Radar wakes up at specified time intervals (5, 10, or 20 minutes) and operates for one minute. If a target enters the Guard Zone, an audible alarm sounds and the Radar goes into normal operating mode, cancelling the Watchman mode. The alarm may also be set to work for a target leaving the Guard Zone. Standard features include EBL's (Electronic Bearing Lines), EVRM's (Electronic Variable Range Markers), TLL (Target Latitide/Longitude) output, Echo Trail, Guard Zone Alarm, Ran Clutter rejection, and automatic control of tuning sensitivity. These features ensure optimum performance in detecting and ranging targets of interest. You can also set a waypoint mark, or 'lollipop,' to show the location of a destination waypoint that you've set on a connected GPS Navigator or Chart Plotter. The Maximum Signal Cable Length is 20 Meters for 12VDC. The 30 Meter Signal Cable is usable with 24VDC Power Input Only.